Which adopts finished products washing process with high-quality cotton canvas. The fabric feels more soft and skin-friendly. This is a basic multipurpose tote bag for most your necessities. With cool style and canvas materials, it brings you more casual feel and happy to carry it all the time. ✔Extremely durable. The zipper is well made, slides easily and smoothly. ✔Most of your daily necessities can be loaded. ✔Scientific and reasonable compartments, makes your goods lay in the bag systematically. ✔LAGAFFE Professional manufacturers, 100% quality guarantee and brand guarantee. We promise to provide high quality products with fast and satisfactory servcie to reach your five-star shopping experience. . NO RISK PURCHASE! 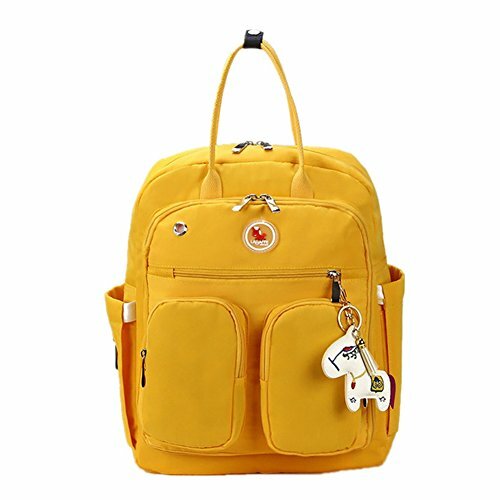 ✔ LARGE Capacity: 11.81 L x 4.33 W x 16 H /inch, You Can Take in The Milk Bottle,Water Bottle, Baby Clothes,Baby diaper,Towel So on in Different Separate Pockets. ✔ Comfortable carrying. A soft foam padding on the back of the bag and the back strap guarantee a comfortable carrying. ✔✔✔ANTI-THEFT BACKPACK: A secret back pocket allow you to put your cards, wallet, phone and other valuable items, convenient and safe. ✔ New design stroller strap system. Back D Rings Design: can be linked to strollers, trolley,making travel easier. If you have any questions about this product by LAGAFFE, contact us by completing and submitting the form below. If you are looking for a specif part number, please include it with your message.